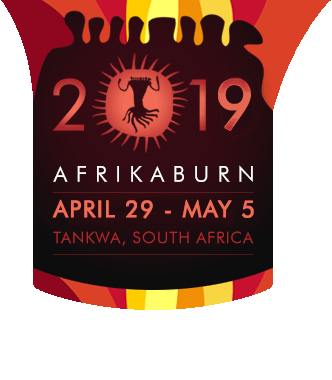 Art created for AfrikaBurn often goes on to bring beauty and joy to communities across South Africa. Many of the large-scale artworks are re-used in urban settings, and some make their way to previously disadvantaged communities, bringing joy to where they end up. The gloriously complex ‘Cosmic Pacemaker’, created by Matt Proxenos and team, was installed in the foyer of Mandela Rhodes Place, on St George’s Mall in Cape Town. Thanks to Matt and his team, and Andrew Currell for facilitating the artwork’s reappearance. Two of the main elements of the amazing ‘Lilith & The Garden of Eden’ installation that bewitched so many in the desert was given a new lease on life, as an installation at Cape Town’s city hall as part of the Open Design programme, which is bringing design to life across the city thanks to the Cape Town World Design Capital programme. The anamorphic sculpture created by Andre Carl van der Merwe and his amazing team that made such a great impression at AfrikaBurn 2012 is now in place on Sea Point Promenade (which is shaping up to be a great public art space) in Cape Town. Created to highlight the plight of rhinos in the face of an onslaught from poachers, the piece has been recreated (as it was burned the year it was shown in the Tankwa) in metal. Apparently the response has been massive and queues are lining up daily to view the piece. Congrats to Andre Carl and all involved! You might remember it under its previous name ‘The Big Boom’, which was erected in Tankwa Town in 2013 – but it’s now taken on a second life as an important spark of thinking and conversations around history and segregation as ‘The Slave Tree’. Erected opposite Church Square in Cape Town and created by artist Nadya Glawé, the artwork is “a temporary public sculpture to mark the site of the Slave Tree, from under which slaves were once auctioned”. Take the time to pass by and consider its significance if you’re in the city – this is a moving and beautiful piece of art with a conscience. Fancy reliving those golden sunset moments in the city? The Mighty Bench, which has provided the perfect perch for Tankwa views for so many since 2012 now has a counterpart in Cape Town! Built by the same master architect and artist that brought the city the Boomslang walkway at Kirstenbosch – Mark Thomas – the mighty bench’s new incarnation is located near the Prestwich Street Memorial. It was created in conjunction with Rock Girl, a grassroots public art and education campaign that partners with artists and designers to motivate for and create safe places for girls and women in Cape Town and across South Africa. If you’re in the area, head over to find it and enjoy! Find out about the The Laingsburg Watersnake Project here. Created in memory of Lady Davina (queen of DPW) by the VuvuCreative, the huge white slipper that gave so many kids of all ages joy at AfrikaBurn 2011 migrated to Deer Park Café playground in Cape Town, where it was enjoyed by countless kids of all ages. The mighty flaming vuvuzelas that provided heat and light at the first few AfrikaBurns were brought into Cape Town and placed along the Fan Walk in Cape Town for the football world cup. Read more about the Flaming Vuvuzelas here.